Sue is the manager at the Union Oyster House, the country’s oldest continuously-operating restaurant and one of Boston’s biggest tourist traps. My roommate and I were seated across from her at a table in one of the restaurant’s many off-shooting dining rooms, tucked around the corner from the Heritage Room, the establishment’s infamous dinette, dingy leather booths and weary wooden tables barely illuminated by the overhead lighting. She was slightly older than middle-age, frank and maternal — she could’ve been an aunt, maybe, or a family friend. I liked her immediately. 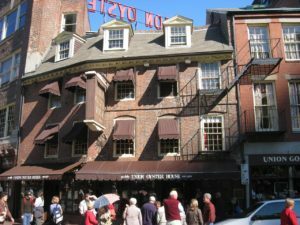 Despite the lack of presidential spirits, there was a plethora of other ghosts, unsurprising considering the history of the building: before becoming a restaurant in 1826, the building on Union Street served as a store for imported goods, the base for the first American paymaster during the Revolutionary War, the print shop where America’s first big newspaper, the Massachusetts Spy, was printed by Isaiah Thomas, and was the home to the future king of France. Sue told us of several reports by delivery boys who, when dropping off goods to the basement backdoor, saw a man dressed in colonial garb hunched over a writing desk, only for the man to vanish after a second glance. She believed this to be the ghost of Ebenezer Hancock, a paymaster general, still worried about his expenses even in the afterlife. Most interesting, however, was the story of Henry: he was a chef at the Union Oyster House when Sue first began serving there, 30 or so years ago. However, after Sue had been there a couple of years, Henry left for a new position. A few years later, Sue learned that Henry had died, but not because she had seen it in the papers or received a call — but because the new head chef, the night Henry died, saw his apparition by the employee lockers, describing him to the T: tall, lanky, salt-and-pepper hair, a goatee, chef’s hat — despite never having met him. Henry’s sudden appearance frightened the new chef enough to send him running. And ever since, any mysterious flickering lights or malfunctioning technology is credited to Henry. To verify her story, Sue called over two other waitresses — both with the same friendly, open demeanor as their boss. Turns out, they’d been working there nearly as long as Sue had — and this, according to Geraldine, one of the other waitresses, is what summons Henry’s spirit. When asked about her own paranormal experiences, the third waitress only shook her head. “The bathrooms,” she said ominously. “They keep breaking — and I went in there yesterday, and walked in on the plumber — I saw his crack!” She let out a giggle at the end, face splitting into a grin. The two other women burst into laughter. “That’s not a ghost story. That’s just a scary story,” Sue clarified. There was something heartwarming about watching these three women interact — to see how well they knew each other, how much they loved the piece of history that belonged to them, how affectionate they were for the ghosts they shared between them. It felt like the whole point.